I posted about finally putting some fics up on AO3 from the Merlin summerpornathon, but I realized I haven't really updated since the Team Gluttony Remix Challenge finished up! 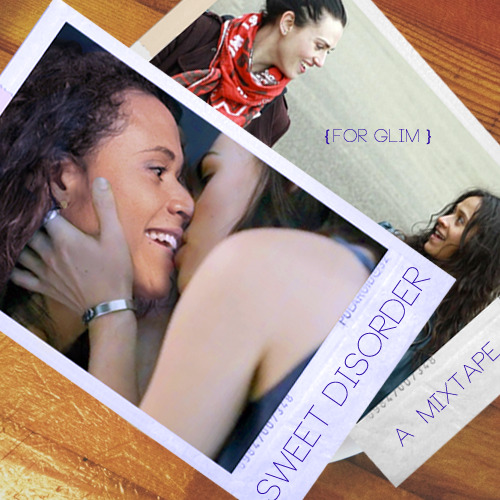 + And also a very girly fanmix/photoshopped fanart for glim's Morgana/Gwen fic, A Sweet Disorder, because I was procrastinating on writing the actual fic, eek. This entry was originally posted at http://whirligigged.dreamwidth.org/318853.html. Please comment there using OpenID. Can I just live inside that Gwen/Morgana smiley kissy picture forever?? GOSH. Oops, hello super delayed response! It was strangely therapeutic to spend a couple of hours on Photoshop having a very vivid image coming together in front of me of the smiley happy life that Gwen and Morgana are living, writing and running coffee shops and wearing scarves and kissing. But the greatest thing about making this album cover was perhaps combing through the internet for pictures of Katie McGrath kissing people, and ladies in particular. My life is SUCH a trial.